To rest or not to rest? That is the question. There are numerous factors doctors take into consideration when building a recovery plan for a concussion patient, including the force of the impact, any pre-existing medical conditions or previous injuries, and the patient’s age. Immediately following a the injury, it’s often easy to see why brain (and body) rest is recommended–especially when the injured person is experiencing pain and confusion. But just how much rest does that recommendation mean? This is my dog Max lying on me after my concussion. I would sleep about half the day, if not more, during this time. Max was worried about me! An increasing number of studies are beginning to show that total rest (or “cocooning”) after brain injury may not be the best thing to do after all. We are beginning to see evidence that recovery can be speedier when patients strive return to normal activities gradually and early-on. By finding the balance between rest and gradual activity increase, those who suffer concussion may see better outcomes than in past years. The question still lingers, how long does one rest after brain injury? That, I don’t have an answer for, but I can tell you this: each person is unique, no two of us are the same. That’s why recovery time varies from person to person. Some may take days, weeks, months, or years to recover, but it all depends on your current situation and factors involved. (Read COVD’s patient FAQs on brain injury.) The best advice I can give you is to listen to your doctor or specialist about how much you should rest. The second half of that advice is to be honest with yourself and the doctors. You don’t want to rush back into things if your brain isn’t fully healed. 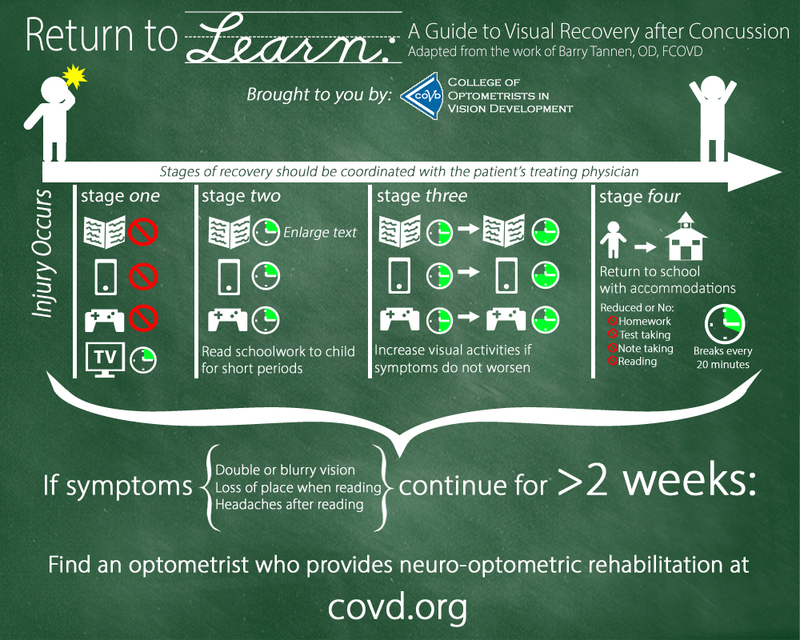 Please help COVD spread the word about brain injury recovery by sharing this post! Thank you. COVD’s Annual Meeting next month in Bellevue, Washington will include a lineup of courses on the intersection between sports, concussion, and vision. Learn more!